As a country, we've donated over $380 billion to non-profits in 2016. We clearly care about organizations in need, causes worth fighting for, and our neighbors down on their luck. But 72% of all workplace giving is coming from individuals––you, me, and the average Joe. Businesses and corporations have more capital and more funds to go around, but they only account for 5% of the donations. The next generation is going to change this. And you need to be prepared. 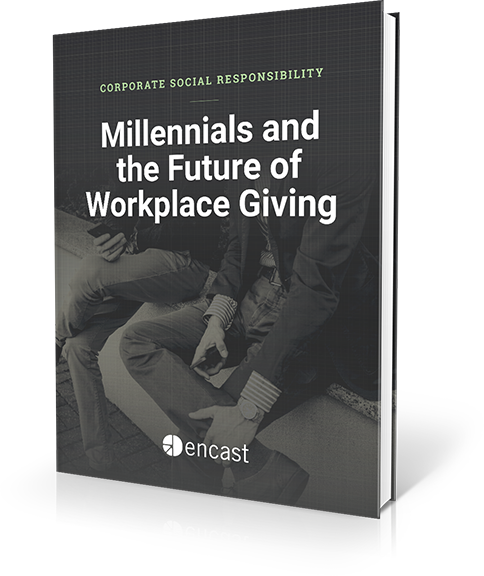 Millennials are going to evolve the workplace into a vital part of the engaged community through charitable giving. Giving back is good business, and they will bring this mentality with them as they become your core workforce. Download our eBook to see more of the statistics that support this idea–and how you can be prepared for the next era of corporate social responsibility!